Big Lagoon State Park is located between the spectacular Perdido Key and the Gulf of Mexico. This allows visitors to explore several different coastal environments all in one place. So, what is an Albino Alligator? Okay, since you asked. 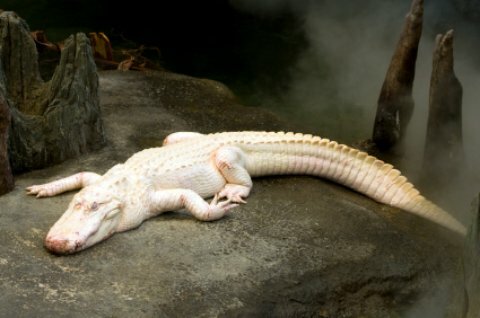 Occasionally, but rarely, animals like this albino alligator are born without pigment (melanin) in their skin. Without pigment, their skin appears milky-like and is unusually sensitive. They will burn easily in the hot Florida sun. Their light eyes appear to be pink because you see the red blood vessels in the eyes. Note, this picture is for educational purposes and not a picture of an alligator indicative of this park. Usually, you have to see one of these in a zoo. They are cold-blooded creatures and need the warmth of a sunlamp or some artificial light to survive since they cannot get their heat from the sun like pigmented alligators. At this writing, there is one in St. Augustine Zoo in Florida. You can see regular alligators in Long Pond mentioned below. There are numerous opportunities to observe countless types of birds and other animals in the pine flat woods, saltwater marshes, open woodlands and nature trails. This panhandle park provides access to the Great Florida Birding Trail, which features nine different communities for bird watching. Another interesting feature is Long Pond, which is inhabited by alligators and provides yet another interesting environment for tourists to observe. Camp out in one of the full facility campsites and enjoy nature at its finest or enjoy a relaxing day on the beach. No matter what you’re looking for, Big Lagoon offers relaxing activities of all sorts. What to Do: Visit nearby Perdido Key State Park. (But only if you handle 52 miles of white sparkling sand, 343 days of sunshine and 77 degrees temps all year). While you are in the neighborhood, take a quick trip to East Beach and trek up the 40 foot observation tower for breathtaking views of Perdido Key and Big Lagoon State Park. Where to Eat: The Sunset Grille is a popular choice for tourists and locals alike. Great tasting, affordable food with friendly service. Where to Stay: Purple Parrot Village Resort is affordable and centrally located to all of Perdido Key and Pensacola attractions. If you prefer to stay in the city, Pensacola provides a lot more hotel options. Don’t forget that there is also some great camping available right at the park!